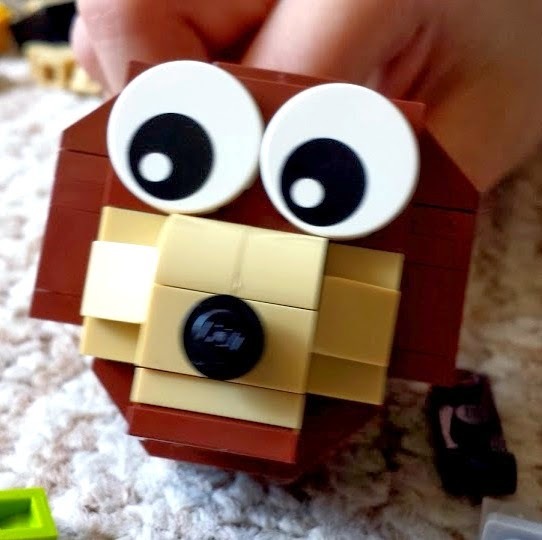 This is a BRAND New way to play with LEGO- Super exciting! Building models will impart much learning in these animal kits! GIVEAWAY PRIZE: Everything you see featured here! Both LEGO sets AND the eeBoo game!! When you think of Earth Day, what image comes to your head? A globe? a forest? a recycling bin? a marsh? Do you ever think of animals? Sadly, some don't. Animals have eyes and eyes are what connects us to them. Our testers love animals. They love drawing them and learning about their special powers. With each detail they learn, they can't help but put themselves in the picture (ie. Could I ever run as fast as a cheetah?) I think this is how we embed more earth-conscientiousness in kids because they learn to relate to the other inhabitants of earth- especially the ones with brains. Living things with higher-order brains have lives with lots of details. We can teach them tons of ominous facts but it's the details that we cling to so lovingly. Details are what make lasting imprints in our minds. Details are what holds our attention. You may not notice this but the border of each card carries a hint to where it belongs. There are six boards, each with a different theme. This one is Fossils & Minerals. I wish you could know how awesome these games feel! This board is Weather and Celestial. 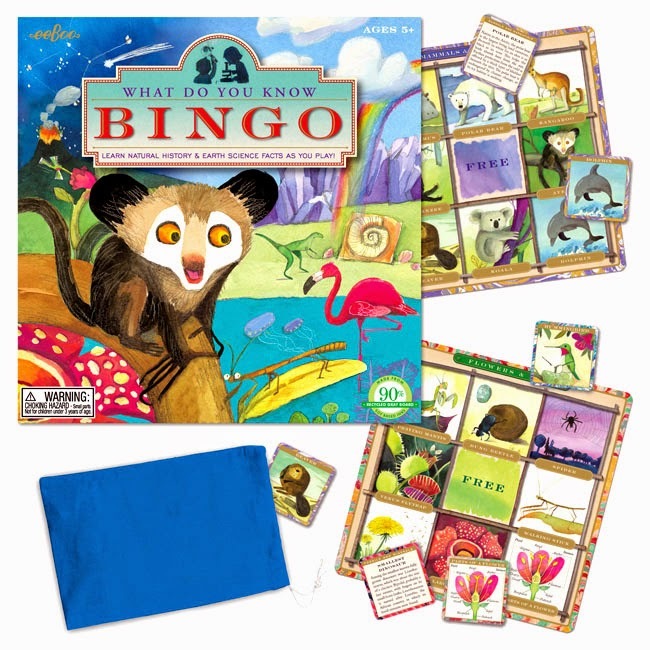 eeBoo redefines the classic game of BINGO and gives us grown-ups a fabulous way of showing our kids the beauty of the earth by mixing color, golden highlights, high-quality recycled paper, and interesting factoids to pique our children's curiosities. 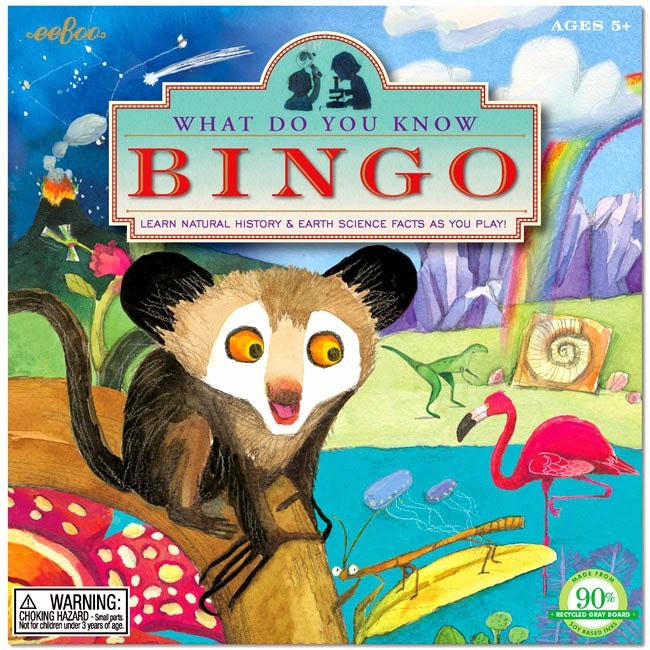 Illustrator Melissa Sweet does an unbelievable job with this game. While each drawing, whether it be of a marsupial or minerals is simple enough for children and yet executed with such skill that even adults will be enchanted too. You'd think that all this rich color and detail is overkill for young children but that's where you must think of toys and games as tools. To me, this is so beautiful, I can make this useful with a three year old as well as a ten year old. As the child gets older, she can appreciate more details that the game offers. One year it may just be the animals. The next, she may fall in love with the gold trimmings. The year after she may be curious about what is written in the back of each BINGO card- it's full of information. I have always associated watercolor as something for kids only but look what she does with watercolor. Her work is kid-friendly but detail-rich enough for grown-up eyes. The funny thing is that kids know when they have the good stuff. They don't tell you but you can see it from the way they handle it. Every eeBoo game we have is kept in perfect condition. Even our tutor, Annie Kim, a first grade teacher at P.S. 166 School of Arts and Technology has fallen in love with eeBoo and uses them in every one of her tutoring sessions with #2. My kids have become so familiar with the artists, Tester 1 has even asked me questions like "Was this made by Melissa Sweet?" Familiarity goes a long way. Just like when you buy a Blue's Clues book to teach kids how to go potty. Playing with eeBoo games is a great way to teach kids how to observe style -details that are hard to describe. It's a level of pattern recognition that I don't know how to teach but the kids pick it up as they play. I prefer the latter method. His arms, body and even tails move a bit;. 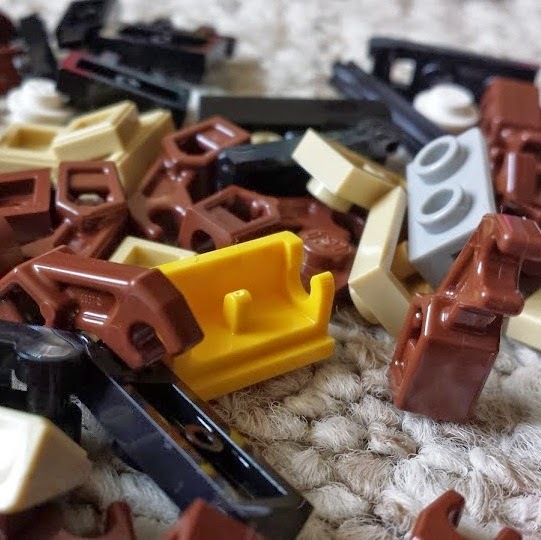 When you think of LEGO, you think of buildings, cars, playsets with functions like sliding doors, removable roof, shutters that open and close. 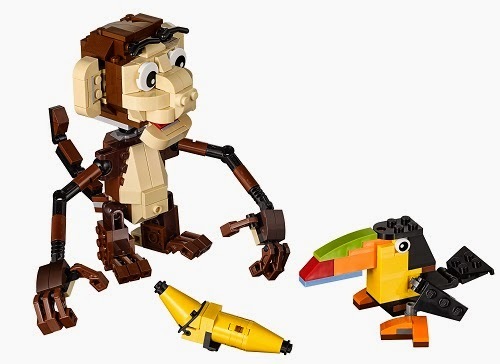 However, LEGO has now come up with something totally new for us. We can now use LEGO to explore body movement and emotional expression. To me that is brand new. Moreover, the scale of these animals is way larger than your typical minifigure. What does that mean? I saw it immediately as a set of new building challenges. This is why Creator animals are so special, it allows for so much movement but adding details don't make it too delicate. Ergo sum: You can play with them... really play with them. Ooh, what is he thinking? He looks like he just did something mischievous, no? Who will get the food first? Squirrel or Battle Bunny? Squirrel looks pretty tough. I like this look. Not totally natural and not totally robotic... somewhere in-between. The first modification was just to give him a little more function but then..
How did this happen? Is this really my child? We are not a militant family. Goodness! This is why kids must always be testing these toys. I couldn't do this if I tried. these animals do not totally look "sculpted" and still have a "built" look about them. This is nice because it has an appeal to artsy kids as well as the mechano-types. 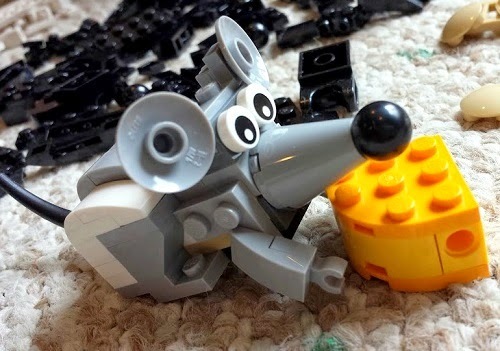 Yes, it is mostly a SNOT (studs not on top) look to the animals but there are some spaces for adding an accessory or a child can just replace something easily. 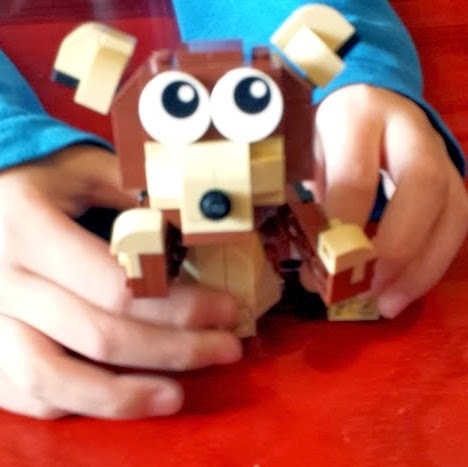 This encouraged my child to modify his animal with ease. Removing heads might be creepy but it gives a new way to observe details... watch! Tester 2's squirrel. Not modified. Squirrel head on Battle Bunny's body. Cute, huh? I am totally thinking Batman and Robin. How about you? 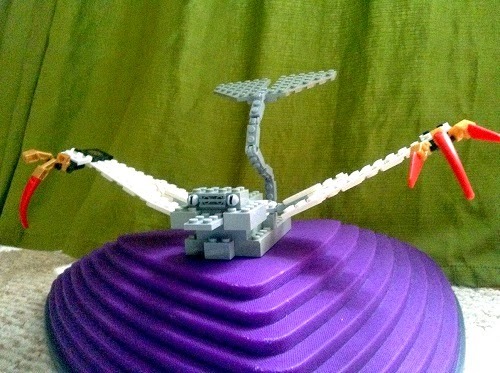 Yes, my little master builder learned more for this set. He made his own animal. He had always made planes, cars, houses, but never animals. I was really proud of him. BTW, you see that tail? 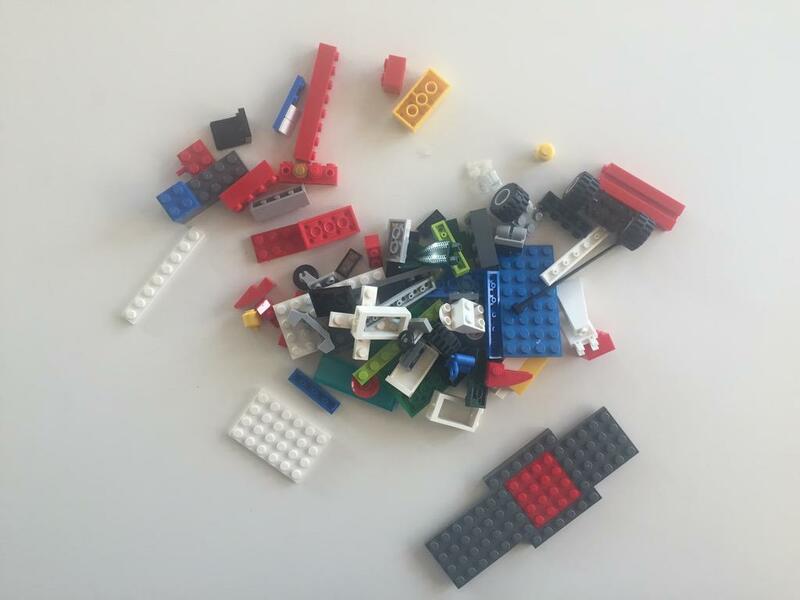 We got a ton of those pieces from our last run at the Pick A Brick wall. 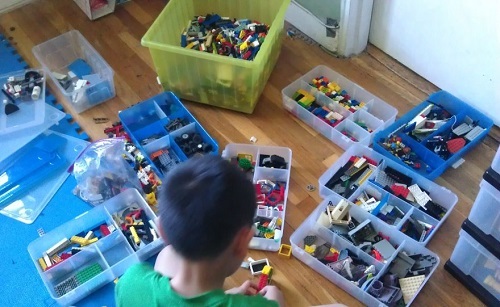 If you like LEGO, you must read my article published at Quartz and the Atlantic and here too! Here we go back to the value of pretend play. Yes, it is very good to make up stories and be imaginative. But take a few moments just to think about what that means in terms of showing feelings. 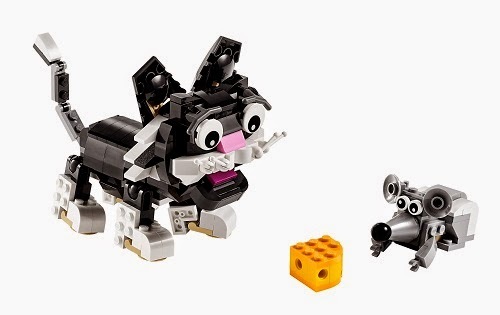 Bottomline: You have not experienced all of LEGO's wonders if you have not experienced the LEGO Creator animals sets. It's more than that eagle set from last year. The eyes in sets sets are unbelievable. That special joint piece for the neck is worth a lot on it's own. Even the Hero Factory like joints (but way smaller) are just so awesome. 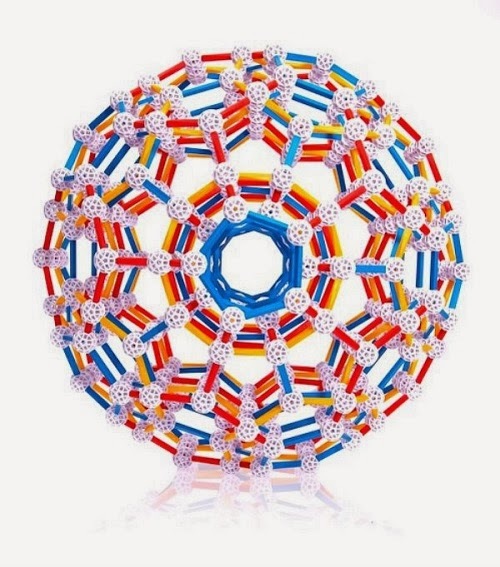 It's LEGO in a new way... don't miss these. A- CAPTION THIS: What's this guy thinking? Do not say, "Where's my body?" B- CAPTION THIS: Is this a liar's face? or a thinker's face? Disclosure: Toys are Tools was not compensated by the manufacturers of anything mentioned here for the publication of this review. The reviewed items were provided to Toys are Tools to facilitate a review. Reviews are never promised. A. "What are you looking at?" http://eeboo.com/store/show/PZUS?parent=games is something I would like to see/have! Caption A. Ooh....I see cookies!!!!!!!!!!!!!! Caption B. I didn't make a pee pee on the floor...it was the fish. eboo has almost everything! But I don't see any jewelry making kits. My daughter is obsessed with jewelry making! 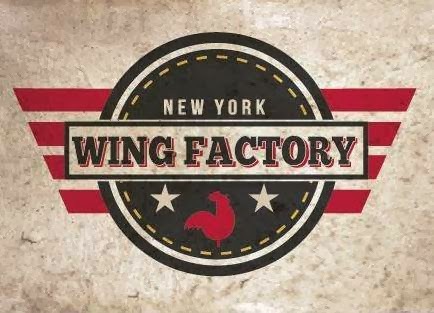 Great store!